Reviewing & commenting on healthcare quality tools, tips & techniques. Remember when you first heard of the Swiss-Cheese model of medical error? It sounds so good, right? When a bunch of items line up, we get a defect. It’s satisfying. We all share some knowledge of Swiss Cheese–it’s a common image. That’s what makes it so attractive–and, of course, the Swiss Cheese model is a much better mental model than what came before, which was some more loose concept of a bunch of items that made an error or, worse yet, a profound emphasis on how someone screwed up and how that produced a bad outcome. Models supplant each other over time. Sun goes around the Earth (geocentric) model was supplanted by the sun at the center (heliocentric) model–thank you Kepler and Copernicus! Now, we can do better with our model of medical error and defect, because medical errors really don’t follow a Swiss Cheese model. So let’s get a better one and develop our shared model together. (1) In Swiss Cheese, the holes stay still. That’s not how it is with medical errors. In fact, each layer of a system that a patient passes through has a probability of having an issue. Some layers are lower, and some are higher. Concepts like Rolled Throughput Yield reflect this and are much more akin to how things actually work than the illusion that we have fixed holes…thinking of holes gives the illusion that, if only we could only identify and plug those holes, life would be perfect! (2) In the Swiss Cheese Model, we imagine a block of cheese sort of sitting there. There’s no inherent urgency in cheese (unless you’re severely lactose intolerant or have a milk allergy I guess). It’s sort of a static model that doesn’t do much to indicate safety. But ahhh, Frogger, well there’s a model that makes it obvious. If you don’t maneuver the frog carefully that’s it–you’re a goner. Of course, we have the advantage of engineering our systems to control the flow of traffic and both the size and presence of gaps. We basically have a cheat code. And, whether your cheat code is Lean, Lean Six Sigma, Six Sigma, Baldrige Excellence Framework, ISO, Lean Startup, or some combination…you have the ultimate ability unlike almost any Frogger player to change the game to your patient’s advantage. Of course, unlike Frogger, your patient only gets one chance to make it through unscathed–that’s very different than the video game world and, although another patient will be coming through the system soon, we’ll never get another chance to help the current patient have a perfect experience. All of that is highlighted by Frogger and is not made obvious by a piece of cheese. (3) In Frogger, the Frog starts anywhere. Meaning, not only does the traffic move but the Frog starts anywhere along the bottom of the screen. In Frogger we can control that position, but in real life the patients enter the system with certain positions we can not control easily and, for the purposes of their hospital course anyway, are unable to be changed. It may be their 80 pack year history of smoking, their morbid obesity, or their advanced age. However, the Frogger model recognizes the importance of initial position (which unlike real life we can control more easily) while the Swiss Cheese model doesn’t seem to make clear where we start. Luckily, in real life, I’ve had the great experience of helping systems “cheat” by modifying the initial position…you may not be able to change initial patient comorbid conditions but you can sometimes set them up with a better initial position for the system you’re trying to improve. Like you, I hear about the Swiss Cheese model a lot. And, don’t get me wrong, it’s much better than what came before. Now, however, in order to recognize the importance of probability, motion, initial position, devising a safe path through traffic, and a host of other considerations, let’s opt for a model that recognizes uncertainty, probability, and safety. With more Millenials than ever in the workplace (even though Frogger predates them!) we have digital natives with whom game imagery is much more prone to resonate than a static piece of cheese. 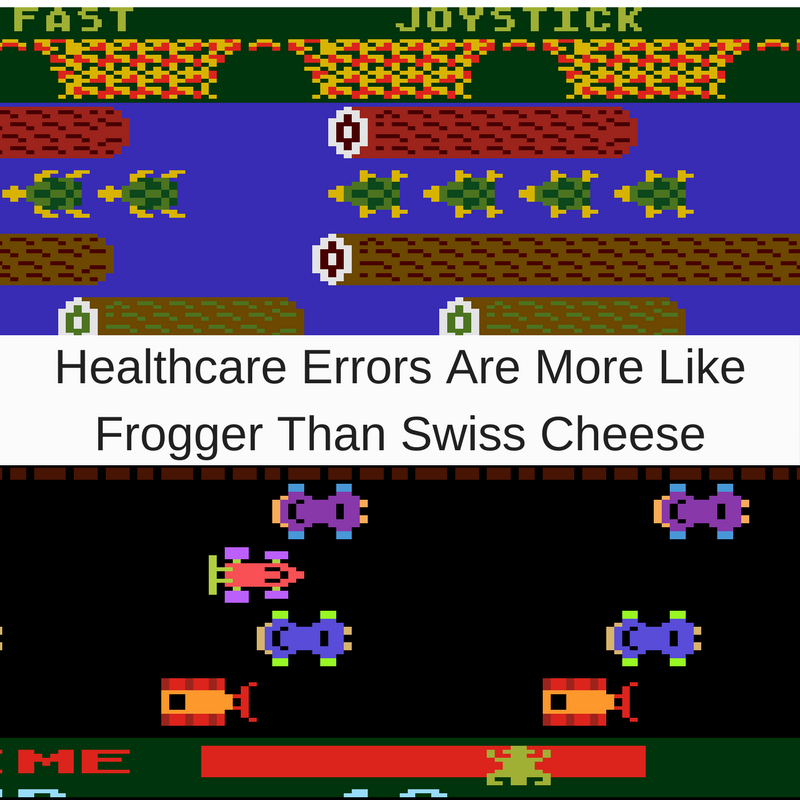 Use Frogger next time you explain medical error because it embodies how to avoid medical errors MUCH better than cheese. Dr. David Kashmer, a trauma and acute care surgeon, is a Fellow of the American College of Surgeons and is a nationally known healthcare expert. He serves as a member of the Board of Reviewers for the Malcolm Baldrige National Quality Award. In addition to his Medical Doctor degree from MCP Hahnemann University, now Drexel University College of Medicine, he holds an MBA degree from George Washington University. He also earned a Lean Six Sigma Master Black Belt Certification from Villanova University. Kashmer contributes to TheHill.com, Insights.TheSurgicalLab.com, and The Healthcare Quality Blog.com where the focus is on quality improvement and value in surgery and healthcare. Previous Previous: Life, Liberty, & The Pursuit of…Healthcare?